IFetch Original Interactive Automatic Ball Launcher for Dogs. PRACTICAL SOLUTIONS FOR PETS WITH PERSONALITY.. If your dog is obsessed with retrieving balls, then iFetch is the automatic ball launcher you've been waiting for! Have you ever started a game of fetch with your dog, only to then spend hours on end tossing that slobbery ball as far as you can, unable to exhaust a seemingly infinite energy supply? Throw those weary arms in the air one last time and rejoice, as the team behind the new pet gadget iFetch is here to save you. IFetch Interactive Ball Launcher for Dogs - What is it? IFetch is an interactive, on demand ball launcher that provides fun for dogs and owners together. 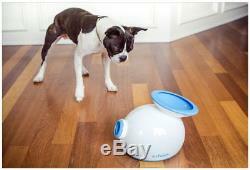 IFetch throws a ball a variable distance when it is placed in the funnel by the dog or person. 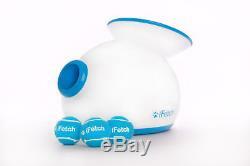 IFetch is a ball launcher that throws balls! IFetch is designed to work with iFetch balls which are 40mm (1 ½) diameter and are not full sized tennis balls! How do I get started with the iFetch? All you need to do is plug it in (or insert 6 C-cell batteries), press the button on the back, drop in a ball, and its playtime. Does the iFetch use regular tennis balls? IFetch uses miniature tennis balls. The iFetch is designed for indoor/outdoor use with miniature tennis balls that are 40mm or 1.5 inches in diameter (the same size as most miniature tennis balls that you can find in pet stores). 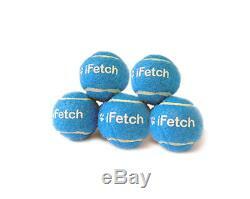 If youd like to order more miniature iFetch balls, head on over to our online store. How far does the iFetch throw the ball? The iFetch has three launch distance settings: 305 cm, 610cm or 915cm (10 feet, 20 feet, or 30 feet). To set the launch distance, all you have to do is press the button on the back to cycle through the settings. The light will turn off after 30 seconds, but the iFetch will remain on (in standby mode) until you drop another ball into the funnel. How long does the iFetch work on batteries? Weve done extensive testing of iFetch and we have found that it will keep throwing balls for approximately 30 hours on a fully charged set of 6 C-cell batteries. If your dog can play fetch continuously for that long, then you may want to enter your dog into the Guinness World Records! My dog slobbers a lot. Some dogs slobber more than others. If your dog is a heavy slobberer, you may need to wipe off the balls from time to time. Some customers who have slobbery dogs have told us theyve found success with miniature squash balls. What happens if I put other things into the funnel e.
While that does sound like a fun experiment, we dont recommend you put anything into the iFetch other than miniature tennis balls, as that is not the intended use of the iFetch. What comes with my iFetch order? Your iFetch comes with three balls and an AU/NZ SAA Certified 100-240V AC Adapter. Training Tips Whether your dog has been playing fetch for years or if this is his first time, the following training tips from professional dog trainer, Nichole Ellis, will help your dog learn how to play with the iFetch in no time at all. When teaching your dog how to play fetch, make sure you train near the iFetch so that your dog can connect the dots between fetch and the iFetch. Train with the iFetch at most three times a day and only for ten minutes at a time. That way fetch stays fun and doesnt become fetch bootcamp. If you feel like your dog is getting frustrated and is unable to get the ball into the iFetch , then just work on reinforcing any behavior toward the iFetch and make sure your dog gets rewarded. If your dog attempts to get the reward via other behaviors e.
Rolling over, jumping up, shaking paws, etc. , its important that you NOT reward these behaviors. If your dog is cautious around the iFetch at first, thats okay. The iFetch is new and different and hes probably not sure what it is. You can start by rewarding him for just going near the iFetch. This way he learns that the iFetch is just another part of the house. With a little time, you can use treats to bring him closer to the iFetch, teaching him to drop the ball as close to the iFetch as possible. After a few training sessions (results may vary) your dog will learn to trust the iFetch and then it will be playtime. What's in the box. The Original iFetch Ball launcher. AU/NZ SAA Certified 100-240V AC Adapter. Save your arm right now with the iFetch. What if I can't pay right away? Of course, we understand that sometimes things don't go as planned so please let us know if you would like to make other arrangements. Just remember to keep us informed. We shop too, we know how things are. Bring your pets - they are welcome inside! Any items that are marked with an Authority to Leave will be left in a safe place if there is no one to sign for it. Unfortunately we cannot accept responsibility for items that go missing or if there is an Authority to Leave. This means you can be assured your item will be covered even if it's lost. How long until you post my order? During busy times (after a weekend, long weekend or holiday), it may take 2 days to process your order. How will my order be packaged? We like to recycle boxes, so your packaging may be pre-loved. We hope that's okay with you! If you prefer boxes to remain intact, please select Express Post. How long until my parcel arrives? Here's the good news... We are able to send to most countries via Australia Post's Pack and Track. We will only send internatiuonal orders with tracking. We guarantee that the product you receive is without faults and can be used for the intended purpose. If you're not 100% satisfied within 30 days, drop us a line and return the item in its original condition and packaging. If the product has been used, we're unable to accept the return and would suggest that it be resold as a used product via available online sources. Whilst every effort is made to make descriptions as accurate as possible, errors may occur unintentionally. In the case of an error made by Lucky Pet, we will attempt to rectify this at no extra cost to you. DOA items (broken or damaged on arrival) All items are inspected at time of packing to ensure no missing parts or damage. All we ask is that the product is not used or expired, is in the same condition you received it and is in the original box and/or packaging. Food We sell only super premium food that is rich in protein. Make sure you change over gradually from standard food. Please see the manufacturers directions for guidance. Toys No toy is indestructible, although some come close, and you should always supervise your pet at play to ensure he is safe and is using the toy as intended. Pets will be pets though! What is the condition of the item? All products from Lucky Pet Supplies are Brand New, Original and Authorised. We only stock items that we would be happy for our pets to have - and they're a fussy lot! Please read our listing description as we try our very best to include all the information available. WHAT IF I want to check the status of my item? What if I want to adjust or modify my order? If there is an error or the address needs to be updated, the order will need to be cancelled. Quality products at competitive prices. We sell only brand new and genuine articles, no fakes or replicas. Personal, one-on-one attention from a real human being who can answer your questions or help you with your order. Fast Dispatch and Quick Deliveries - our stock is located in Melbourne! We are Australian owned, not a faceless multinational corporation owned by an equity company with no interest in pets. Our shop address is: 586 Barkly Street West Footscray VIC 3012. We are open: Mon-Fri: 10-5.30 Sat: 10-2. For us, there's nothing more heartbreaking than a house without pets! As the founders of Lucky Pet Supplies, and the proud parents of one geriatric cat (who lives with her grandparents) and two (almost) middle-aged dogs, we're passionate about our pack and we know that having pets has nothing to do with becoming the pack leader, it's about opening your home to a different kind of family. Xoxo Jeff & Jo and Yoyo and Peaches. Love and protect your pets. Join our Mailing List for the Latest News & Exclusive Offers. The item "IFetch Original Interactive Automatic Tennis Ball Launcher Dog Toy" is in sale since Tuesday, November 17, 2015. 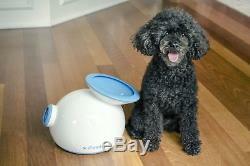 This item is in the category "Pet Supplies\Dogs\Toys". The seller is "luckypetsupplies" and is located in West Footscray. This item can be shipped worldwide.